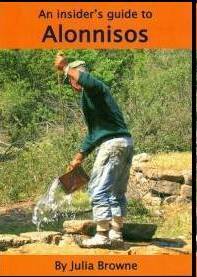 Prior to visiting Alonnisos you may want to consider purchasing a guide book about the island. One such book is called “An Insider’s Guide to Alonnisos” was recently published by a company called Travelleur Publishing. It is written by Julia Browne, a British expatriate who has lived on the island on a full-time basis for many years. Julia had her first house on Alonnisos built in 1990, and moved there permanently in 1996. She has worked on the island as representative for a major UK travel company since 2001, and this book is the culmination of years of research for her ‘villa information folder’. While I’ve only met Julia a couple of times, each time I found her to be a lovely person, and I have no doubt that her book is an excellent information resource for anyone traveling to Alonnisos. For more information regarding this book, and to purchase it as well, click here.